in Creative & Tech, Social Media with tags #RealtimeTips, adweek, Canon U.S.A., New York, NYC, Photographs, Smart Billboards, Tips Both comments and trackbacks are closed. 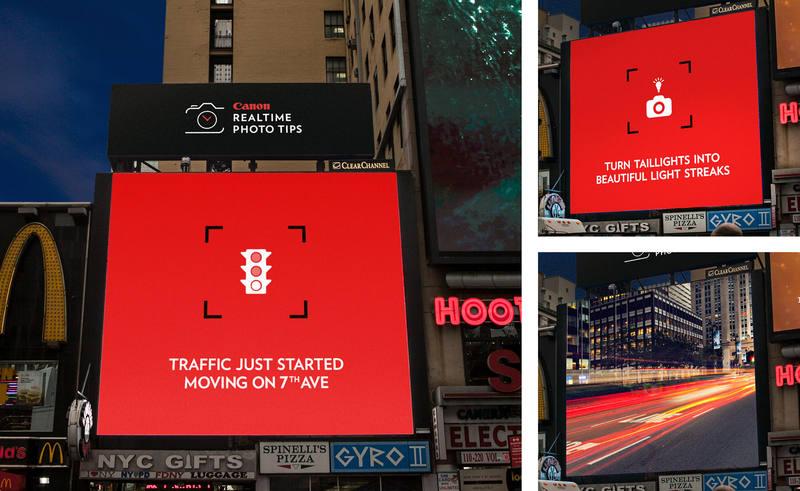 This week, Canon U.S.A. (client) is using smart billboards around New York City to provide in-the-moment photo tips, helping people capture beautiful photos and take their shots from good to great. Using social listening, Canon identified New York City’s most photographed destinations – the Flatiron District, Central Park South (5th Ave and 59th Street), the Brooklyn Bridge and Penn Plaza – to serve as the locations for one standing and three pop-up billboards. Each billboard is powered by real-time API data – including weather conditions, location, traffic and time of day – to show more than 200 custom tips based on different real-time conditions. The billboards also encourage people to visit CanonPhotoTips.com which features 100 stunning cinemagraphs and more inspiring photo tips. To support photographers of all skill levels, Canon has staffed each of the pop-up locations with photo experts to provide in-the-moment tips and an array of Canon cameras, lenses and filters for people to try. Throughout the week, Canon will be responding in real-time to fans commenting in social media with tips on how to take great photos anywhere using the hashtag #RealtimeTips. The effort is further being supported through paid media and influencer partnerships.